This contribution discusses the use of member checking in Tot, Kenya and Engaruka, Tanzania as enriching practices for both the researched and the researcher. By utilising a series of pamphlets produced in local languages, participants are able to see the result of their contribution to the research and give them a chance to have a second say by adding or rectifying what they would have reported earlier. In this way, member checking enables a researcher to realise any erroneous understanding of community practices under examination. Member checking is indeed far from perfect, but its employment improved the trustworthiness, transferability and confirmability of the study, writes Martina Angela Caretta. According to McDowell (1999), feminist geographers are concerned with disclosing the existing connections between gender and space divisions. However, it is fundamental to bear in mind that using the backdrop of feminist geography does not mean the sole investigation of women’s situation (Hall 2002). This might seem a banal precision but this is a common misunderstanding due to the quasi exclusive focus of feminist geographers on women. My study is based on the analysis of both genders’ conditions, presenting the relational and structural dynamics of how men and women share spaces and labour practices, while possibly bringing in more voices of women. Nevertheless, while the aim is not to solely highlight the position of women, their circumstances undeniably emerge to be characterised by oppression, lack of power and unequal access to resources; thus, the relevance of grounding this study on a feminist epistemology. Feminist epistemology emerged in the 1980s as a critique of epistemology per se, normatively accounting for what can be considered knowledge and intending to be gender neutral, rational and objective (Cope 2002). A crucial element of feminist epistemology is the attempt to overcome hierarchical exploitative relationships between the researcher and the researched (Maynard 1994). The researcher strives to engage participants directly in the research process through a wide array of methods, e.g. participative mapping or focus groups mediated by locals themselves. Among these methods is also “member checking” or “participatory checking” (Cho & Trent 2006). This technique is aimed at respondent validation of preliminary findings, that is to say at improving the researcher´s confidence in preliminary results and, when repeatedly used, at reaching trustworthiness of the research. 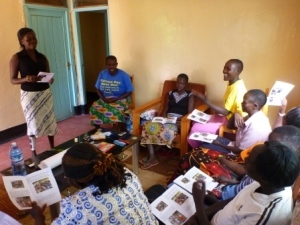 Throughout my own research, I have used this method by utilising a pamphlet written in the local language (Swahili), which was shared with participants to reflect upon our previous encounters. The following section introduces the use of this method in details. My research took place in two small villages: Tot, Kenya and Engaruka, Tanzania. Both villages are located in dry-lands and have ancient gravity irrigation systems which have been subjected to historical and archeological studies, but have not been investigated for their current developments. By investigating their current use, the overall project aims at assessing whether an expansion of those furrows systems have been taking place and what were the triggers behind this. Within the project aim, my thesis takes a gender perspective and investigates the local gender division of labour in relation to small-holder irrigation farming. 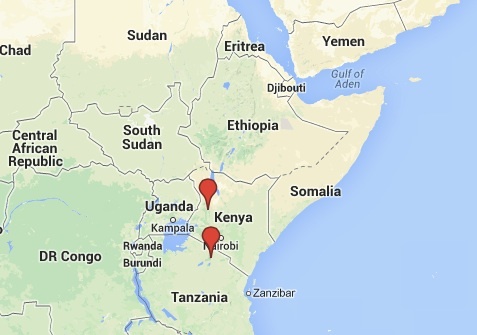 I have conducted six research visits to these locations between 2011 and 2013. For the first three visits, I stayed a few days each time: I first took a preliminary look and successively went back shortly afterwards to greet people, gather new impressions and collect survey data gathered by research assistants. I did three extensive fieldworks in May-June 2011, January-Februart 2012 and July-August 2013. I spent 3 weeks in each of the two villages, staying in the field roughly 7 weeks at a time. In total I spent seven months in the field which is comparable to an average ethnography with the advantage of having seen the development and partaking in the changes within the two communities. In Tot and Engaruka, locals speak their indigenous idiom on a daily basis, but are also conversant in Swahili, being it the official language of both countries. Given that Swahili is understood in both communities, I chose to produce a pamphlet, employed as a member checking technique. The idea to use this method came from my colleague Östberg who did the same during his research in the 1990s in Tanzania (Årlin et al. forthcoming). For my second extended fieldwork I took back to the communities a two-sided picture-full pamphlet, which carried previously gathered data, categorized according to themes (e.g. labour, crops and climate) and outlined with facts reported by men and women. 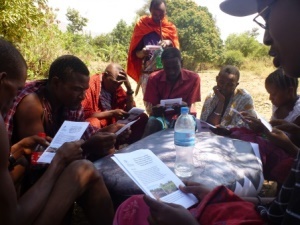 During this fieldwork session it emerged quite clearly that Swahili was not being fully understood or read by everyone in Tot, so for the final extended fieldwork in July-August 2013 my assistant and interpreter translated the pamphlet into the local language Marakwet. Most importantly, for this last fieldwork, two different types of pamphlets were produced for Tot (e.g. women´s role in agriculture, groups, food vs cash cropping) and Engaruka (e.g. agricultural practices enhancing soil fertility, groups, irrigation and expansion of the irrigation system) in order to complement the data on different topics. Several photos were included in the pamphlets so that analphabets could recognise familiar faces and recall the contents following the images. Photo elicitation is a key component of these pamphlets: pictures stuck more to someone´s memory than words especially where people are not exposed to an image culture. Pictures help people recall better what happened the last time we met and elicit in them those memories about the past and what went through since our last encounter (Harper 2002). Locals were given a copy of the pamphlet to bring home. Photos attracted family members’ attention helping the task of explaining the contents to them, while spreading the knowledge of the ongoing research and my presence in the community. Even pupils screamed my name in the streets because they had read the pamphlet! Focus group participants and interview respondents were presented with a pamphlet before beginning an interview in order to get the conversation going. Starting off with the pamphlet was also useful to set the context of my research and to make people aware, in case we had not met before, that I had been around, knew their community and their agricultural practices. At the outset, people were informed either by me or my assistant that the pamphlet contained information they had given me in the previous year. Then, we would tell them that I wanted to check with them whether I had correctly understood what they had shared with me. If that was not the case, I wanted them to rectify my comprehension. Lastly, we would ask if they wanted the assistant to read or translate the pamphlet for them or they wanted to read it by themselves. Depending on the age of respondents and their level of education the pamphlet was either translated in their native tongue or the assistant would help their reading. Grasping the content was aided by the partition in themed sections with corresponding photos, which were referred to by the research assistants to further substantiate the reading. Respondents could follow by looking at their copy while the assistant would use another one. Interruptions were frequent as respondents were commenting on both the photos and the facts presented in the pamphlet. Reactions to the content were of different nature, but almost everyone had to add whether they were in agreement or disagreement. They wanted to add details to the descriptions of their labour routines, to underscore the role of men in cultivation, to claim their gendered discourse of community organisational arrangements and most importantly to correct me. Administering the pamphlet revealed my erroneous understanding of their community practices. Through the lens of the respondents, it appeared that the data I had gathered during my first fieldwork session was describing labour arrangements and crops, which had profoundly changed in the last ten years. In fact, people reported the discourse about how things should function in their community based on traditional customs and crops that had been negotiated and replaced by new ones. Coming to this realisation was certainly a fundamental turning point for my study because it made me rethink my research aims and the way I was asking questions. Indeed there was an underlying misunderstanding between respondents and me: I wanted to know about the present and how they had gotten to the current labour arrangements and crops and not about the past. Some people, particularly the older ones, had a negative impression about the current situation of their community and the new phenomena (i.e. climate change, cash economy, market connection) that were influencing their habits and customs and preferred to refer to their idealised picture of the past. These breakdowns in understanding are a crucial element of discovery in the research process and even though they might be dangerous in relation to the validity of our study, they also present great opportunities to reach a deeper understanding of local dynamics (Crapanzano 2010). In the context of a feminist epistemologically grounded study, member checking was a particularly enriching practice for both the researched and the researcher. Participants physically saw the result of their contribution to the research and rethought through their first interviews. The pamphlet as such and the practice of researcher’s asking for the participants’ comments for improvement were perceived by them as the possibility of having a second say by adding or rectifying what they had reported earlier in order to give the most correct picture of the changes that had taken place in their community. As a researcher it was challenging to simplify findings and exposing them in a short and straight forward way in a new language. Moreover, given the novelty of member checking, no guidelines for its methodological processing existed and I had to come up with the modalities of administering the pamphlet myself, adjusting it time after time, making sure I was taking fully into account all the respondents’ comments. Nevertheless, the success of participatory methods should not be overestimated (Tsouvalis and Waterton 2012). Member checking is indeed far from perfect, but its employment improved the trustworthiness, transferability and confirmability of the study because it gave “an accurate reflection of reality (or at least, participants ‘construction of reality)” (Cho and Trent 2006: 322) while facilitating a less hierarchical relationship between the researcher and the researched. Martina Angela Caretta received her BA in Development Studies at the University of Padua, Italy in 2008 and a MSc in Sustainability Science at Lund University, Sweden in 2010. She conducted her MSc thesis research in Kenya on microcredit schemes and climate change adaptation thanks to the Legal Empowerment of the Poor scholarship. She started her PhD at the Human Geography Department at Stockholm University in 2011 and has since then spent 7 months in the field between Kenya and Tanzania studying gender relations in smallholder irrigation farming. Her research project is financed by SIDA, Swedish International Cooperation Agency. “Current expansion and past dynamics of small-holder irrigation farming in African dry-lands, measuring landscape, labour and climate interactions” is the working title of the SIDA (Swedish International Development Cooperation Agency) funded interdisciplinary research project that Martina’s PhD thesis is part of. She is a contributor to her department blog Farmlands. This entry was posted in Local epistemology, Research design, Visual Methods and tagged feminist geographies, local epistemology, member checking, research design, visual methods. Bookmark the permalink.